Christmas is fun not only for us, but also for our familiars – the cats, dogs, rabbits, and other furry creatures we share our lives and homes with. Perhaps you want to celebrate the special bond between a friend or relative and their pet, or perhaps you are the proud pet owner and want to pamper your animal companion? Have yourself a furry little Christmas with our pick of the best gifts for pets (and pet lovers). Find more Christmas gifts and decorations on our dedicated hub page. Ever struggled to take a good selfie with your dog who seems to be looking at anything but the camera? Now there is a solution: The Pooch Selfie Stick Smartphone Camera Accessory holds your dog's attention with a tennis ball, making for a perfect selfie every time. Well, that's the theory, anyway. Petcams are all the rage now, allowing you to see and talk to your beloved pet when you're away. The best ones are specific to your type of pet; The Furbo Dog Cam, for instance, senses when your dog is anxious and barking, so that you can talk to them. Ahem, check out our guide to the best pet cams to find one that's right for your pooch or puss. If your recipient likes cats, they'll probably love whatever you get them, so long as it is cat-shaped. The Saskia Salt & Pepper Shakers from Oliver Bonas are super cute, but not too crazy, so will look great in anyone's kitchen. The latest in the world of personalised gifts – a Personalised Pet Cushion. As if their cat/dog didn't already know the sofa is reserved for them. With busy lifestyles and long working hours, our pets are sometimes too busy to feed us... Haha, just kidding. What we meant to say was that feeding a pet on time can be a struggle for some of us; and if a pet needs medication, things can get even trickier. So, make life easier for the pet lover in your life (or yourself, for that matter) with Feed and Go Smart Pet Feeder, which can dispense wet and dry food, and medication, and is fully controllable via your phone. Smart. The style-conscious will love The Raised Wooden Dog Bed by Charley Chau. It's sleek and chic, and painted in Farrow & Ball paint, no less! Ridiculous, obvs, but we LOVE it. Cats love hiding under things, fact. So do rabbits. If you have a small furry friend, the Pet Teepee is just the ticket. Fun for the pet, and looks cool. Available from Etsy. Did we mention getting things cat-shaped? How about making them part of your living room decor? The Adna Kissing Cats Lamp from Dunelm is on the right side of cute and pet-obsessed but is still elegant enough to look good in your living room. Anyone who owns pets will know that treats get everywhere and make a mess if you don't keep them in a designated storage jar or tin. The Purrfect Pet Treats Tin by Sophie Allport is pretty and will look good on any kitchen worktop. Dogs love walkies, so much so that many will bring their lead to their owner every morning. Celebrate this ritual with a dedicated dog lead hanger by Siop Gardd. Available at Not On The High Street. This one's definitely for owners rather than pets: keep toys tidied away in a pretty personalised cat toy storage bag. You know the tidiness won't last long, but the bag is very cute and lovely to give or receive as a gift. Available from Etsy. What better way to announce a home with pets than with a pet-themed doormat? The Pink Cat Doormat from Maisons du Monde is both cute and on-trend, with its dusty rose colour that will work well with any colour scheme. What dog lover will not like the Shark Bait Dog Bandana from Pet Pooch Boutique? It's cute, it's 100 per cent cotton, and it's got sharks on it. We love it. They need it. Now that's what we call a classy way to celebrate their pet – a bauble decorated with an exquisite drawing of their dog. Created by Paintmydog, these very pretty baubles will easily fit into a contemporary Christmas tree decorating scheme. Cat lovers will be delighted with Hannah Turner's cat-themed tableware: choose just one item, a jug or a plate, or go to town and get them a whole mini-collection of cat-printed porcelain. There's even a cat-shaped trinket tray. Anyone who has had a dog knows how much they love getting wet, whether from running around in the rain or taking dips in a lake or pond. Help them dry off their dog with the ingenious Classic Collection Dog Drying Coat from Ruff and Tumble. It's made from thick cotton towelling fabric, is easy to put on, and looks great. No more wet dogs and messy towels. If your recipient has a cat, that cat has claws, simples. And they probably already have a cat scratching post or two, so surprise them with something a bit different (and so nicely designed that they might think you've given them an expensive Mid-century coffee table). The Ultimate Cat Scratcher Lounge by PetFusion is made from corrugated cardboard, which cats love to scratch, and has an attractive (for both cats and owners) wave-like shape. Won't look out of place in even the most stylishly designed living rooms. 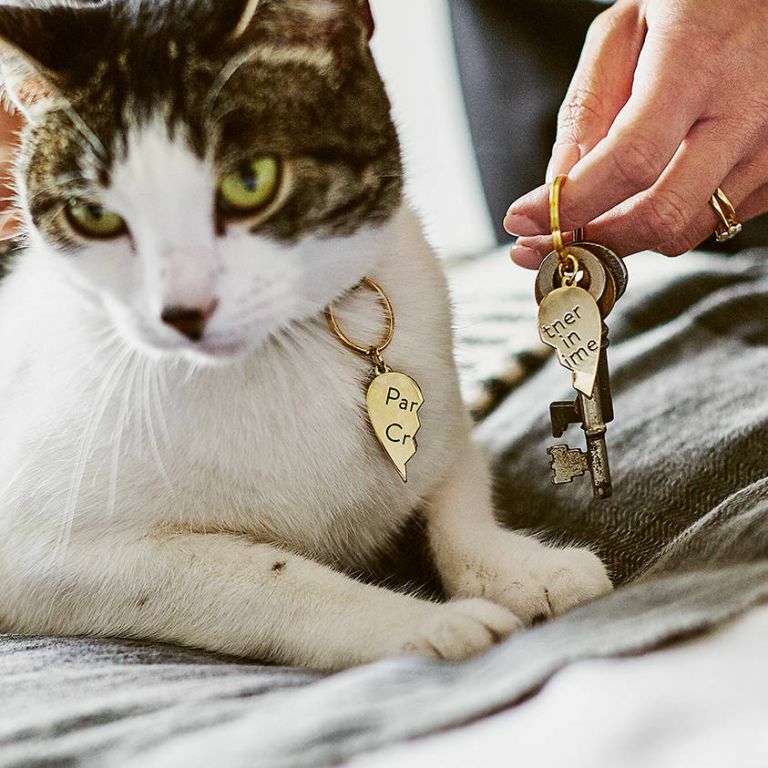 A perfect gift for any best friends no matter if they're human or animal, these best friend charms read 'Partner in Crime' and can be worn around your pet's collar or popped on a keyring or necklace for you. There's also the option to add a personalised pet ID barrel for your furry friend in case they get lost.